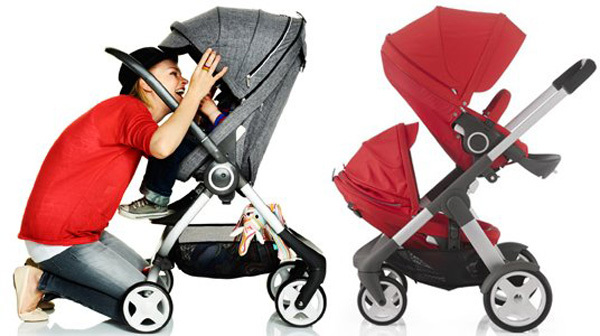 Update - Stokke Crusi and Scoot prams landing soon in Australia! Update – Stokke Crusi and Scoot prams landing soon in Australia! Good news, Babyologists. This duo’s arrival has been much awaited and now the uber stylish Stokke Crusi and Scoot prams are nearly here! We know many of you have been eagerly awaiting the arrival of Stokke‘s newest prams since we teased you with them back in October last year. They will be available here in Australia from early May 2013! The Crusi is the very first tandem pram for Stokke and the design has been executed beautifully, switching between a tandem and single pram effortlessly with the use of the Stokke Crusi Sibling Seat without sacrificing safety or style in the process. Stokke Crusi is priced $1699 and includes the seat and chassis, while the carrycot is available for separate purchase at $499. The Crusi isn’t making a solo trip all the way to Australia – the Stokke Scoot (priced $899) is coming along for the ride! The Scoot is Stokke’s lightweight stroller contender – weighing in at under twelve kilograms, with a winning design that involves a one-handed fold plus front and rear facing positions, perfect for being on the go! Remember, Stokke Crusi and Scoot won’t arrive in the country until the end of April at the earliest, so we hope to see them in stores soon after that. Minimee are taking Scoot and Crusi pre-orders now!